Question: What do you think about preaching verse-by-verse messages through books of the Bible? Let us never forget that those of us who stand for God’s Truth not only being knowable, but binding on all, are in a serious war. This is not a skirmish or a battle. It is a war. In his book The Truth War John MacArthur exposed the tremendous battle that is being fought over what is truth and what isn’t. The Church is wounded and compromised to an extent greater than most of us can imagine. Brian McLaren has said that the primary purpose of Jesus’ incarnation was not to provide a way for His people to be saved from their sins, but to show people how to be Kingdom people. He makes the message sound so right and our flesh loves that message, but it isn’t Biblical. This statement is nothing more than unbelief packaged as an alternative truth to designed to deceive people into discounting the truth from God’s Word thereby keeping them in darkness. It should be clear that this is a direct attack on the Gospel. In this part of the interview, we specifically asked how Andy engages an audience, something that North Point (and Andy) are known to emphasize. He gives some interesting insight in answer to that question. 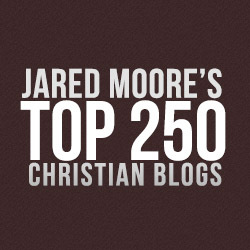 Also, we asked about a hot-button topic, verse-by-verse preaching. Andy went to Dallas Theological Seminary, a school known for verse-by-verse preaching, but he takes a different approach today. And, in his answer to our question on the subject, he was (I think) being intentionally provocative. Take a look and share your thoughts in the comments. Question: So, how do you engage people? Andy: One of the things that we talk a lot about around here is what makes for a relevant environment? As a pastor we tend to err on: Is the information true? Not even helpful, but is it true? That is, if I present true information that is true to God’s Word, then I get an A. No, we are teaching the Bible, so we are assuming it is true. You don’t get any points for that. Good grief, we are teaching the Bible–it better be true! The more relevant questions should be: Was the presentation engaging? And was the information helpful? If you have an engaging presentation with helpful information, people will come back next week for more of that. If you are engaging but not helpful, after awhile they will grow weary. It is interesting but I did not learn anything. If it is helpful but not engaging, then I am bored. And it may be stuff that I really need, but if you didn’t engage me, I can’t stay with you. You need to be helpful and engaging. People who are trying to figure out communication in preaching need to figure out where do I need propping up? I may have all this great insight and truth, but if I am not engaging, then somebody needs to help me be more engaging. That may be visual aids. That may be speaking shorter. There are ways to make almost anybody be more engaging. It may be good to start off by saying, “I am not a very good communicator.” That helps. I want you to know what you are about to discover–“I am not really that good but I have some helpful information.” Now I am engaged. And as guys evaluate their preaching, those are two huge things. Is it helpful? Am I engaging? What is Andy’s focus of his preaching? Is it God’s glory? Is it to obey God above all things? No, his whole approach to his ministry is man-focused. He gives lip service to preaching the truth, but on this blog we have shown several times where Mr. Stanley’s preaching is not Bible centered at all, but rather is temporal and shallow. Andy: Guys that preach verse-by-verse through books of the Bible– that is just cheating. It’s cheating because that would be easy, first of all. That isn’t how you grow people. No one in the Scripture modeled that. There’s not one example of that. All Scripture is equally inspired, but not all Scripture is equally applicable or relevant to every stage of life. My challenge is to read culture and to read an audience and ask: What is the felt need? Or perhaps what is more important, what is an unfelt need they need to feel that I can address? Because if they don’t feel it, then they won’t address it. So how can I make them feel an unfelt need and then make them feel like they need to do something about it? But when you do that, people are like, “Man, that is amazing. You’re brilliant.” No, all you have done is unearthed a need and you talked about it. “I have never heard anyone talk about that before.” Probably, no one has ever made you feel that before. So they talked about it, but it didn’t register because they didn’t make you feel like you needed to hear about it to start with. There is more of course, but here we have it straight from Andy Stanley. He has no concept of the Holy Spirit working through the preaching of Word of God as in the following passage. What is this “being transformed by the renewing of your mind?” This is hearing or reading the Word of God and being transformed by the work of the Holy Spirit as we submit to it. Andy Stanley has placed himself in the place of the Holy Spirit. It isn’t the preacher’s job to do the work of the Holy Spirit. It is the preacher’s job to preach the truth from God’s Word leaving the spiritual work up to the Holy Spirit to transform people. Also, there are plenty of passages on the Bible where we are commanded to study, teach and preach God’s Word exegetically not eisgetically as he does. Andy Stanley’s problem is the same as Brian McLaren’s. They are both in unbelief. They both approach Christianity from the flesh. They both insist that all we do in our religion be man-centered. Therefore, what we must seriously look at is the difference between professed faith and true saving faith. Those with the latter are regenerate. They have the Holy Spirit. They are New Creations. However, if a person is a professing Christian alone without saving faith then they are simply unregenerate and religious. If we simply look at “works” it might be hard to tell one from the other. So how do we tell? We must look at God’s Word. 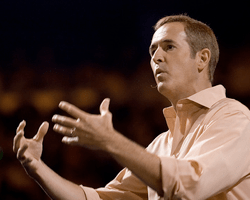 Perhaps Andy Stanley is just a pretender like Brian McLaren. Where do we start? We must admit that the main difference between a regenerate believer and lost person is that one is in belief and the other is in unbelief. Therefore, if we look at the Bible’s use of the word “unbelief” then we can draw a narrow line between the two. From this study we can see where true saving faith lies. Then we can look within to examine ourselves to see how much unbelief is in our faith. To do this, we must see exactly what unbelief is. Our flesh believes that unbelief is simply making a bad decision while faith is making the right decision. We naturally believe that unbelief is nothing more than an error in judgment. However, unbelief is actually a rebellious and violent principle of opposition to God. In the Bible we find that the words “disobedience” and “obeyed not” come from the same Greek words as “unbelief” and “believed not.” The writers of the Bible used “unbelief” and “disobedience” as synonyms throughout Scripture. They are the same word in the original Greek. Please carefully reason through the following statement: “We cannot rightfully say we have saving faith while living in unbelief. It is a contradiction.” If we change the word unbelief to disobedience, the contradiction remains. Paul tells us that we cannot claim saving faith if we are living in disobedience. Peter does as well. We cannot separate unbelief and disobedience because they are the same word in Greek. They are synonymous. Conversely, obedience and faith are as well. Adam’s sin, which plunged all of Man into unbelief, was far more than a mere negative failing to believe God’s clear command to not eat of the tree in the midst of the Garden. This passage tells us that it was Adam’s unbelief that was a damning sin, and so it brought the fall. Adam was not deceived by Satan’s lie as was Eve. Adam’s sin was in discounting God’s smallest command while demanding to have his own way. This is self-will, which is the essence of sin. Unless self-will is broken there is no salvation, no saving faith. Adam’s sin was the first act of unbelief in the history of Man. From this we see that unbelief is a damning sin. Here is another example. “Unbelief” comes from the same Greek word as “disobedient.” This tells us that they could not enter because of unbelief. Did they have faith? They believed enough to follow Moses in the Exodus, but what happened to them in the wilderness? They were condemned. They saw the plagues in Egypt. They saw the Red Sea part. They saw and ate the manna. However, they still would not obey. How did Moses admonish them for their unbelief? This is unbelief. Unbelief is far more than a spiritual struggle to question the existence of saving faith by the grace of God within us or not. When we struggle there it is a trial of faith, but that isn’t unbelief. Unbelief is a gross damnable sin. It is rooted in a self-will that has NEVER been broken. It is determined to have its own way and sit in the seat of God. Unbelief is evident in self-will, rebellion, defiance and disobedience. Therefore, it is a contradiction to claim saving faith while walking in self-will. Unbelief is also directly connected with hatred. Unbelief is connected with hatred because the conscience condemns them, so they hate. This is the source of viciousness and retaliation we experience from those in unbelief when we stand on God’s Truth or rebuke those in apostasy or heresy. A true brother or sister will receive our concern with love, but those in unbelief turn on us and become our worst enemy. They want the condemnation from their conscience to stop. Unbelievers, i.e., the counterfeit believers hated our Lord Jesus Christ because He told them the truth. When we emulate Him they hate us as well. It is by this that we know them. Our Lord pinpointed the distinction between faith and unbelief. What is it? It is the love of God. Those He was rebuking could not have saving faith with their will totally dissolved in God’s will without a motive of love. Genuine believers are not in unbelief. Therefore, they are not consumed by disobedience nor do they hate other believers. On the other hand, there is nothing to keep professing believers who are not genuine from fabricating good works, but since they are in self-will, the truth of their unbelief will eventually become manifest as in manufacturing a false form of Christianity as did Andy Stanley. We see this in the growing apostasy in men such as Brian McLaren who unabashedly attack the veracity of the Gospel and say their message is the real Christianity. This entry was posted in Apostasy, Christian Authenticity, Disobedience, Religion, Unbelief. Bookmark the permalink. Some times the Holy Spirit wants and prompts a different message. But for the rest of the time, I believe a cyclic reading schedule like the lectionary would do essentially the same thing on a 3 year cycle. Most Pastors use it, anyway, and it does work it’s way through the whole Bible. All I know is that when I am away from God’s word I can be a very horrible person. When I return to God’s word it confirms I can be a very horrible person and provides me with an instant remedy. STAY IN GOD’S WORD! If I want cotton candy christianity it isn’t very hard to find these last days. May God forgive us! So sad to see the son of Charles Stanley go that direction…sigh. Andy Stanley is a disciple of Charles FInney and Robert Schuler. SLIMJIM – it’s worse that Charles Stanley is a major proponent of the Free Grace Alliance, which is a snake pit of easy-believism and denial of the Lordship of Christ Jesus.